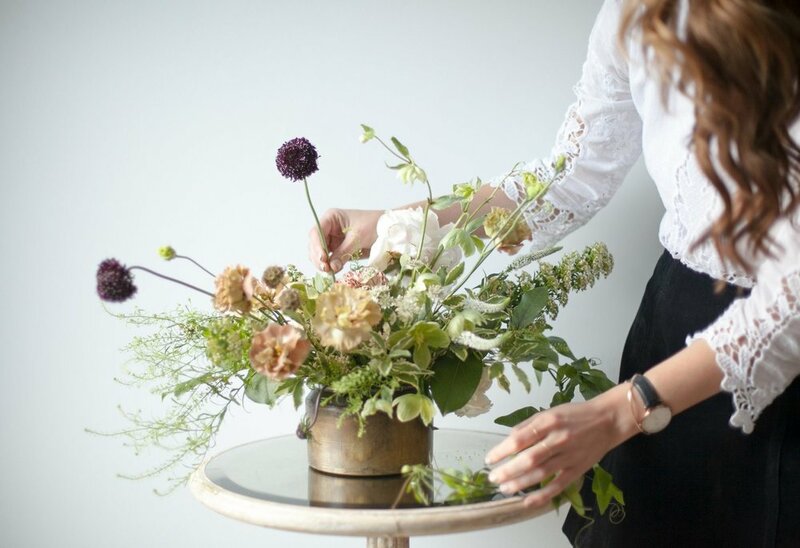 At Celsia Floral we love nothing more than to share our love of flowers, so join us for one of our in-house workshops, uniquely designed to give you the skills to create beautiful and elegant arrangements for any occasion. We change our workshop series by the season to make the most of the best that nature has to offer. It's that time of year again...In this very special class we will celebrate the beauty of the much-loved flower, peonies. With a shipment of blooms arriving specially for this class, we will teach you to create a Spring table centerpiece where peonies are the shining stars. Instruction will include, proper care and handling of cut flowers, tools of the trade, vase preparation techniques and how to design a floral centerpiece. Due to peonies having a flowering season of just two short months, this is a class that will be held only once each year. NOTE: When ordering, please choose in-store pick up (this option is presented after checkout), and for delivery date, select today's date (this entry doesn't really matter). (no tickets will be issued). Cost: $175 per person. Maximum 20 people. BOOK: Click Here to be taken to our online store and reserve your spot today. What’s included: All workshops are open to all levels. We will provide all materials, supplies & product, and you will leave the workshop with your beautiful creation. There will be light refreshments and nibbles while you work! Cancellations: No refunds available; store or workshop credit offered if cancelled 3 days or more in advance of the workshop. We are excited to share with you two styled table centrepiece workshops. We will be teaching our signature vase arrangement, complete with a styled background where your designs will be photographed. Using the finest seasonally available foliage, blooms and branches. Concepts of asymmetry, dimension and movement will be explored to create a one of a kind vase arrangement. Learning techniques such as proper care and handling of cut flowers, tools and tricks of the trade. NOTE: When ordering, please choose in-store pick up (this option is presented after checkout), and for delivery date, select the order date (this entry doesn't really matter). Cost: $155 per person. Maximum 12 people. Place: HANA, 449 Hamilton St.
Place: Celsia Florist, 1930 Arbutus St. NOTE: When ordering, please choose in-store pick up for the date of the workshop. No tickets will be issued but please let us know, when placing your order online, if you are purchasing it as a gift, as we can print a special voucher for it. With the gardens in full bloom, we are supporting a few of the local growers in the lower main land to create a one of a kind seasonal bouquet. We will have some of the finest blooms, foliage and branches from Twigs Twisted and River and Sea. Concepts of asymmetry, dimension and movement will be explored to create a hand tied bouquet. Learning techniques such as proper care and handling of cut flowers, tools and tricks of the trade. Cost: $145 per person. Maximum 12 people. Date: Sunday, June 9th, 2019 11:00am – 1:30pm. Get the girls together or bring along your work colleagues! Name the date and allow us to host you for a creative, fun-filled workshop with your nearest and dearest. Prices for custom-made workshops start from $145 / Per Person (Minimum 8 - 10 Attendees). Please inquire for more information. Corporate events, bachelorette's, birthday parties baby shower's or any excuse to get a group together and learn about flowers! We are available for your private workshops. Using the finest seasonally available flowers and foliage we will teach you bouquets, vase arrangements, flower crowns, wreaths, and terrariums. You will learn techniques such as proper care and handling of cut flowers, tools and tricks of the trade. All tools and supplies provided and you will take home your finished creations. Do you want more information on Celsia’s Floral Workshops? We’d love to hear from you. Send us an email today. Keep an eye here and on our blog, Facebook and Instagram for new flower school class releases and dates.